Chile offers an incredible variety of scenery. This thin straw of a country stretches all the way from Antarctica in the south to hot desert at its northern end. Inbetween we find forests, mountains, fjords, glaciers, beaches, fertile river valleys, lakes of every color, and hundreds of islands. Stretching from Mexico to northern Canada. Stretching from Norway to Libya. 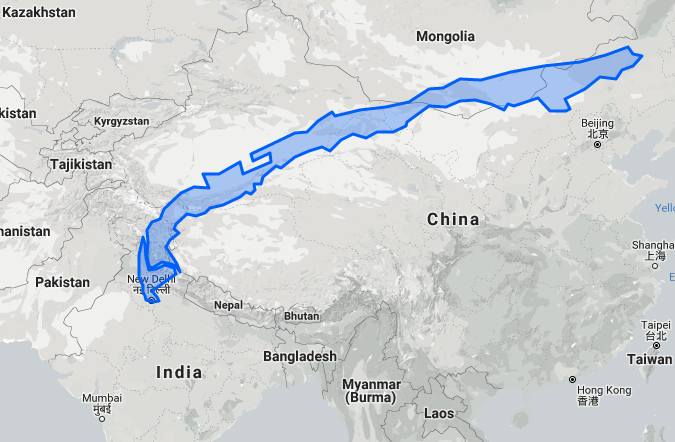 Stretching from New Delhi, India, past Beijing, China. 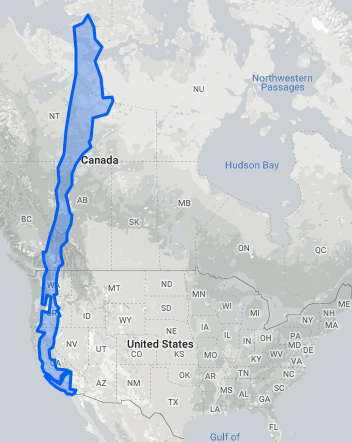 Why am I telling you about the length of Chile? Because I am about to share with you a drive that on the map of the country may look like a short one, but in real life it is actually quite the adventure. 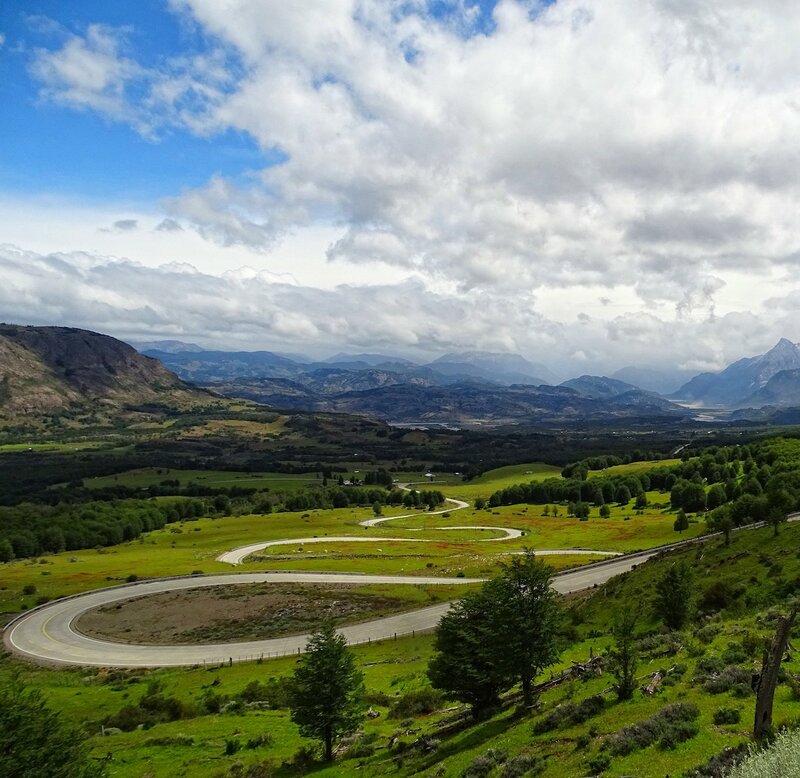 And while you no doubt have heard about Torres del Paine, the Atacama desert, Santiago and Easter Island, you may well never have heard about the part of Chile that this drive goes through. Carretera Austral is also known as Ruta 7. It starts in Puerto Montt and ends 1,200 kilometers further south, at the shores of Lake O’Higgins. 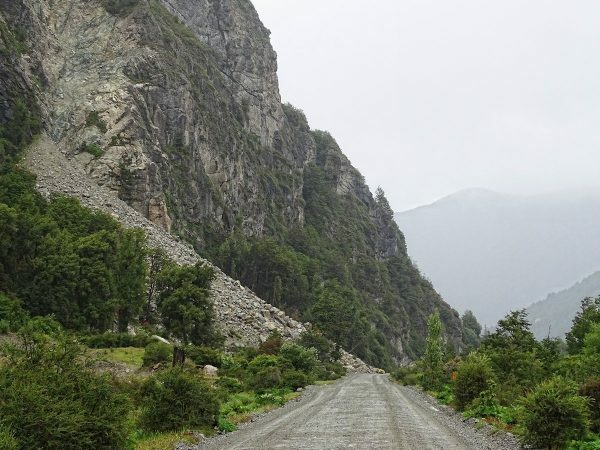 The intention was to build a road that would connect all of Patagonia to the rest of Chile, without having to go through Argentina. After 30 years of construction they weren’t even halfway through the hard part. With the vast glaciers of the Southern Patagonian Ice Field ahead, construction was halted. But the road is more or less there, surrounded by amazing scenery. The first 700 kilometers are good, paved roads, with plenty to see around it. 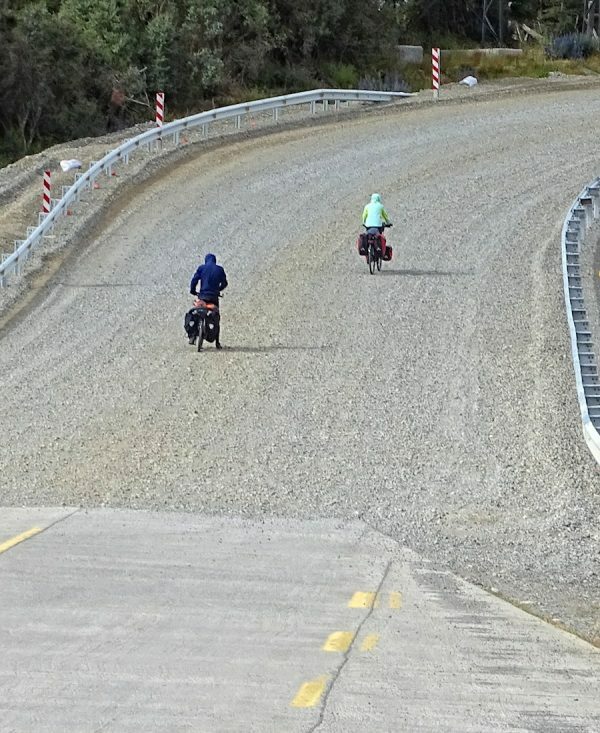 But for maximum fun and excitement, it’s best to start your drive in Coyhaique. It’s the southernmost town where you can both get a rental car and stock up on supplies. So that’s what I did. 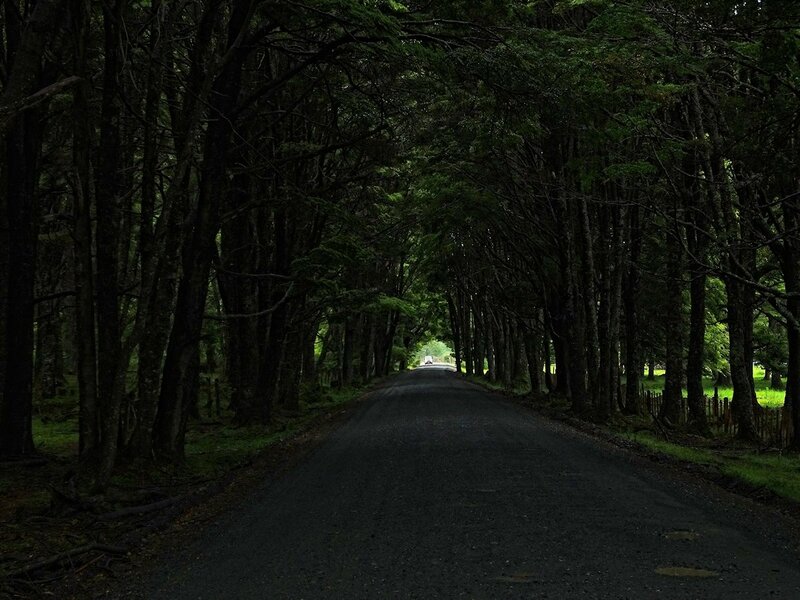 From Coyhaique, the Carretera offers good road for almost another 100 kilometers, until Villa Cerro Castillo. Then the gravel road commences, and it’s a difficult drive for about 450 kilometers until the road just ends. With a week on my hands, I could have driven the whole way and back. Google estimates the 565 kilometers to be a 14 hour drive, but at that pace my trip would just have ended off a cliff somewhere. Instead, I take my time, driving with care and stopping for many hikes. I don’t regret my decision, but I feel true sorrow when I have to turn the car around in Cochrane. There are still 230 kilometers of road left to explore. But I’m skipping ahead. Let’s start at the beginning. 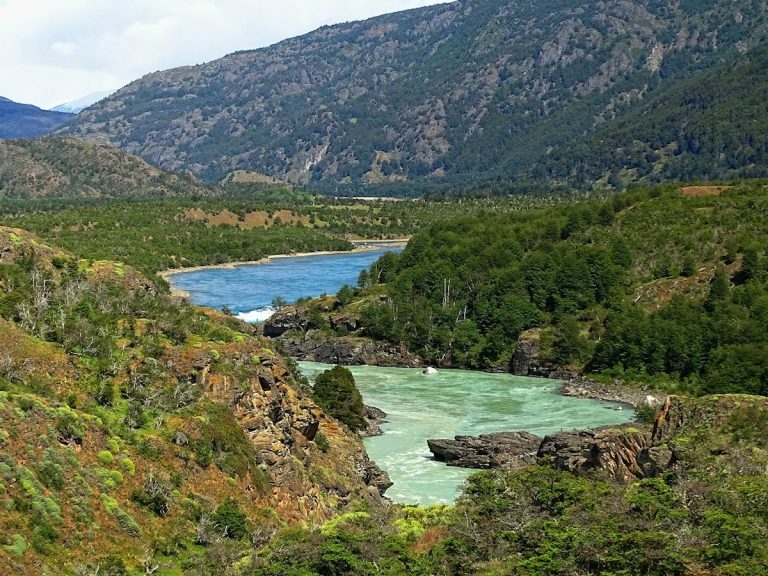 Southern part of Carretera Austral. The blue section is paved road, the yellow and red sections are gravel. My journey covers the blue and yellow parts. About an hour from Coyhaique there’s a crossroads. Most cars continue straight ahead, towards the Argentinian border. But I want to follow Carretera Austral, a rough road to nowhere, so I make a right turn. I don’t know exactly what I’m in for, but I’ll go down this road for as long as I can. 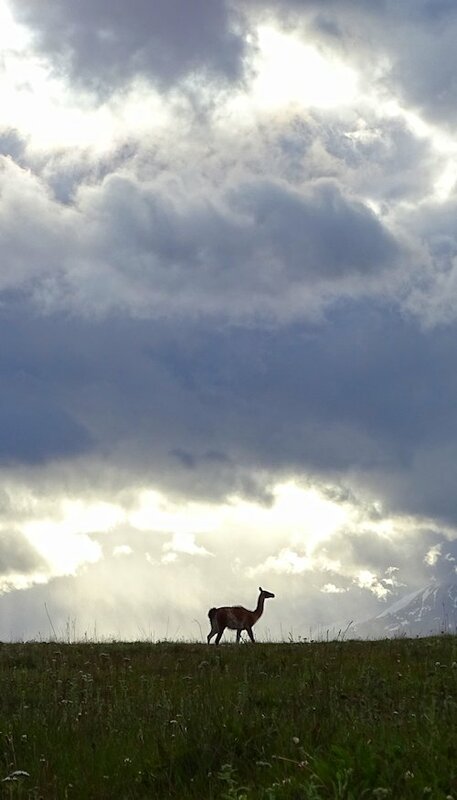 The road climbs through dense forests, among the last strongholds of Chile’s national animal, huemul, a kind of deer. I already go fairly slow. Partially because I don’t want to crash into an endangered species, but mainly because the scenery is already stunning. As I enter the Cerro Castillo nature reserve, the road follows a deep valley, surrounded by mountains wearing layers upon layers of colored rock. A mountain pass at 1,100 meters altitude is the highest point on the Carretera. From there I follow a winding road down into a plain dominated by a truly castle-like mountain, Cerro Castillo. Drifting clouds means I can only see the mountain part by part. That’s okay. I would easily have spent an hour just sitting there looking at this majestic mountain anyway. At the foot of the mountain there’s a village with the same name. It’s not much there, but I find a room for rent above a small grocery store. Bare chipboard walls are decorated by old compact discs and, fortunately, panel heaters. It’s December and supposed to be summer in the southern hemisphere, but this part of Chile hasn’t noticed. They do know how to stay warm, though. Smoke rises from every chimney in the village. The houses are old, just like most of the people who live in them. All kinds of materials have been used to repair and expand the buildings. Every garden is filled with scrap metal and old junk. It gives the village a certain charm, although that is felt more by visitors than by locals, I suspect. Living in old and cold quarters isn’t good for anyone. Chile is trying to fix it. On the other side of the road, an entire new village is being built by the government. Every house will look the same; modern and robust. This is progress, although the old charm will be gone. Sometimes boring is better. Anyway, the scenery nearby will remain just as glorious as ever, so it’s all good. On day two, I get only 200 meters of asphalt before the paved road ends. From now on I’m on loose gravel until I return to this hamlet. I stop to check the spare tire. It’s there. I relax a little and start enjoying the view. When leaving Villa Cerro Castilla, we also leave sealed roads. 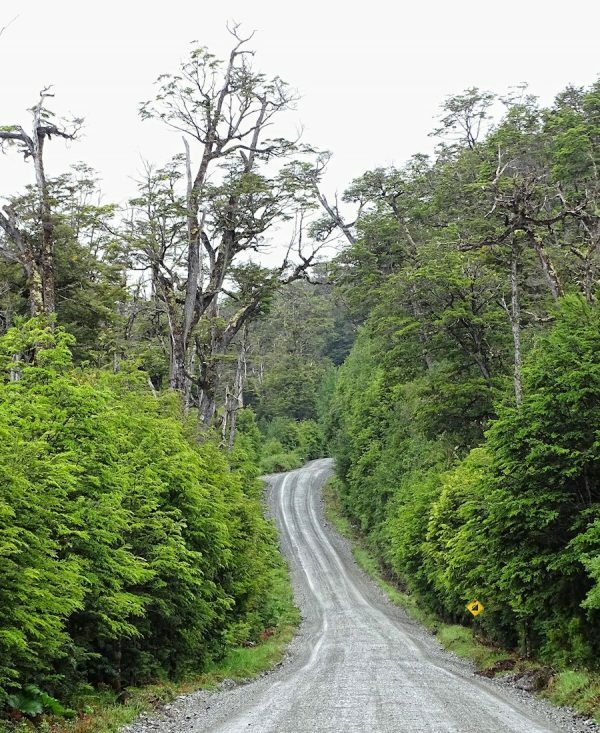 Dense, jungle-like forest surrounding Carretera Austral. Patagonian trees are tough and remain standing long after their death. This part of Carretera Austral keeps reminding me about how hard it is to construct a road through this kind of landscape. A massive rockslide blocks half the road. The longest tunnel I drive through is formed by dense forest. An old bridge is no more. I send a thankful thought to every engineer and worker whose efforts have enabled me to drive a cheap rental car this far into Chile’s wilderness. If anywhere along the gravel part of this road can be called a tourism hot spot, it’s Puerto Rio Tranquilo. A population of about half a thousand people make a living here mainly by showing tourists around. For a hundred US dollars and upwards, you can participate on long hikes including entering ice caves inside glaciers. It’s a good deal, but the main attraction here is marble. Not as decor on grandiose buildings, but just plain and simple marble being in its natural state. Because this area is so far away from everything and everyone, the marble has been left alone. At least by people. Nature herself is more aggressive. The village is on the shores of Lago General Carrera. 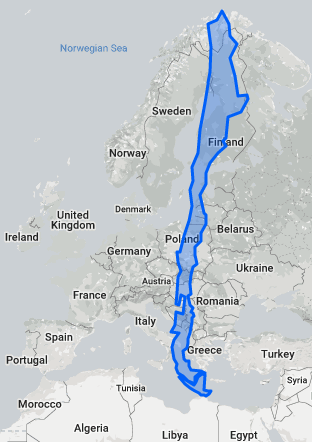 It’s a big lake, shared between Chile and Argentina. Like most of Patagonia, the typical weather situation here is heavy wind. Big wind on big water means big wave. 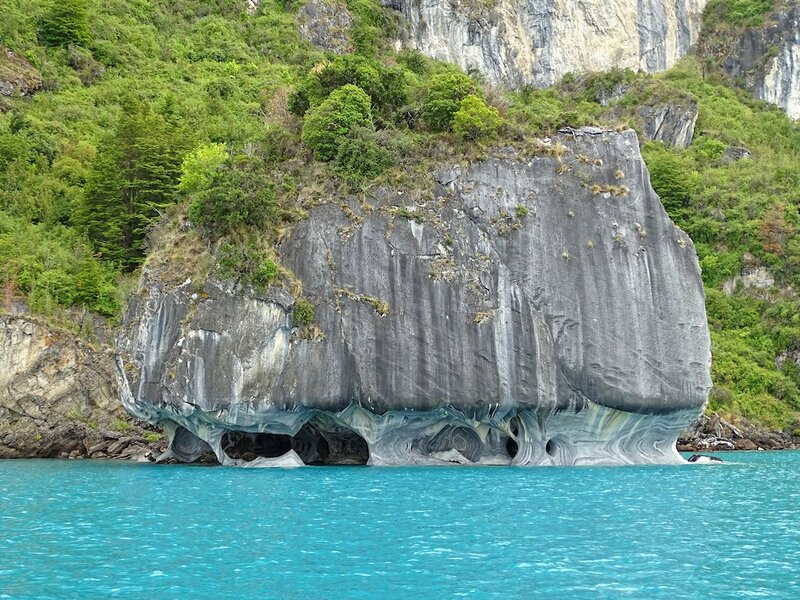 These waves cut into the relatively soft marble on the lake’s edge, creating caves and natural sculptures. Some caves are large enough to allow boats to go inside them. And they do, because what you see there is beautiful. 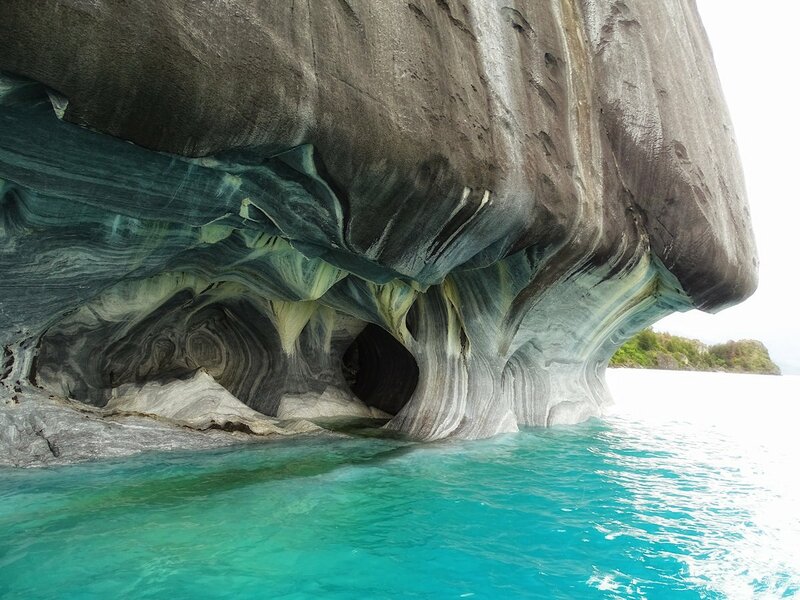 The names of some of the spots are quite descriptive; Capillas Marmol (“the marble chapel”), Catedral Marmol (“the marble cathedral”), and so on. My stop here becomes longer than planned. That’s okay. Large marble rock attacked by aggressive waves. Soon I pass another wonder created by water. At first it looks like magic, but there is an explanation. As the clear Rio Cochrane is joined by the muddy Rio Nef, the river immediately turns green. I spend a couple of days in and around Cochrane. With a population of almost 3,000, it is by far the largest of the settlements along the road I follow. Decent accommodation and satisfactory food is available, and there’s a wide range of day trips that can be done out of here. Exploring the town itself doesn’t take long. The houses lining the straight streets predominantly have wooden walls and a tin roof, but generally done in a much nicer finish than in the small villages I have passed. There’s more money here, although it’s not entire clear what they do to earn it. Administrative centers tend to be like that. I find Internet, at last. It’s slow, but working at just about the pace my driving the last few days has gotten me into. 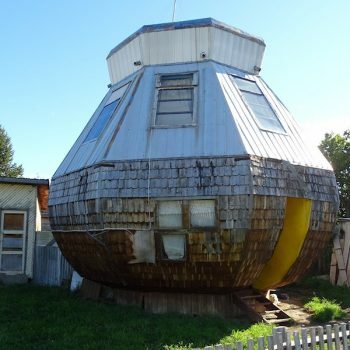 A presumably huge fan of the caffeine-rich maté drink, a South American favorite, has built a house that looks like the cup that maté usually is served in. There’s a statue of a condor, and a supermarket painted in garish colors. People nod and smile at me, an obvious stranger. I quite like it here. Especially because the town is surrounded by gorgeous mountains. Much of the area around Cochrane is now a national park, Patagonia Park. If you ever bought clothing or equipment from the company Patagonia, you have contributed to this. Throughout many years, the founders of the company bought up land that previously was used to raise sheep and cattle. They aimed to protect the land and take it back to its natural state. Now this land has been donated to Chile, on the condition that it becomes part of a large national park system where wild animals can freely roam across an astonishingly large area. It’s a wonderful thing, and I’ll have to save the details about how glorious it is to hike through this park to a separate future report. But it is. Glorious. And by hiking these mountains, getting lost only in time, I suddenly find myself needing to return to Coyhaique to catch a plane. That’s just how it is. Yet the sadness of having to leave is not stronger than the joy from having been allowed to come here. So after a few minutes of driving north, I smile again. Even though I obviously have to drive back the same way I had come, it was like an entirely new trip. Things look different when seen from a new angle, and also often vastly different in a different light. 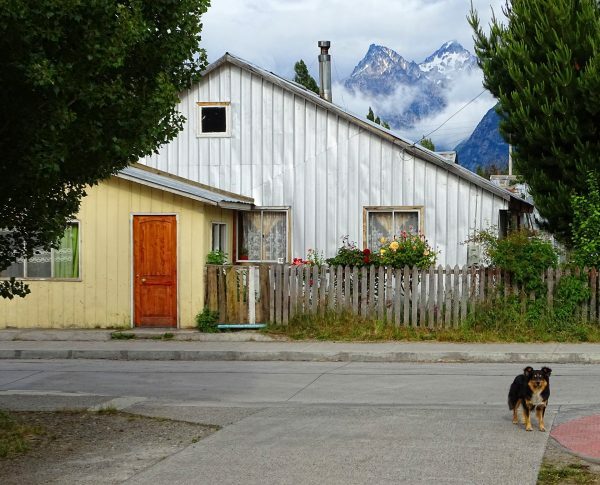 This very much goes for the kind of world class scenery that surrounds the Carretera Austral. I see few other vehicles on the road, but among them there are several that have stopped only to change a blown tire. Fortunately, though, somehow I make it all the way back to the car rental drop-off without incident. It’s a bit selfish, I know, but in a way I’m actually glad the road is in a bad condition and leads nowhere. It means that this area can remain a bit hard to get to for a little while longer. This should give it time to slowly adapt to tourism in a way that is good for both locals and for tourists. Already many changes are on their way. I already mentioned the new homes being built to improve people’s lives. The conservation areas around the road are being established sustainably. More famous places in Patagonia, like El Chaltén in Argentina and Torres del Paine in Chile, currently receive more visitors than they can handle well. 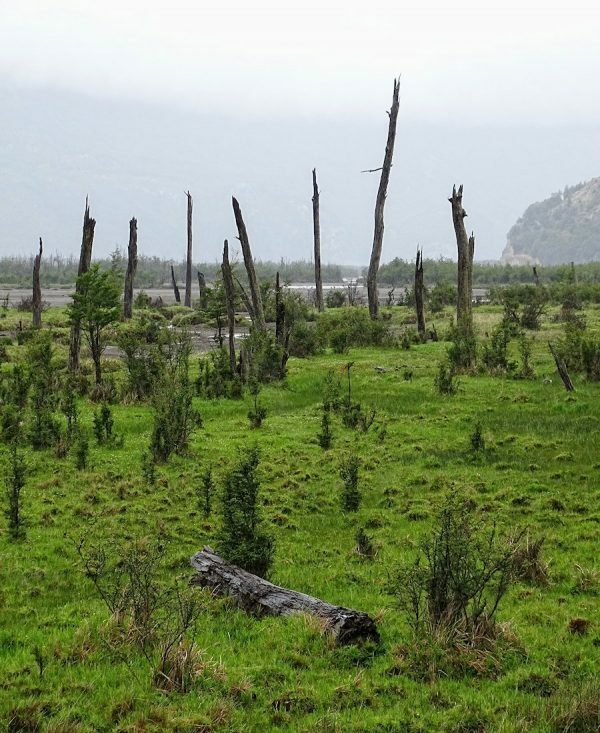 There’s bound to be a spillover effect that will hit Carretera Austral more and more. I hope this goes well. In the meantime, as long as you promise to act responsibly, I encourage you to head this way and make your own adventure. If you’re not certain what that means, please ask. Bjørn. Free. 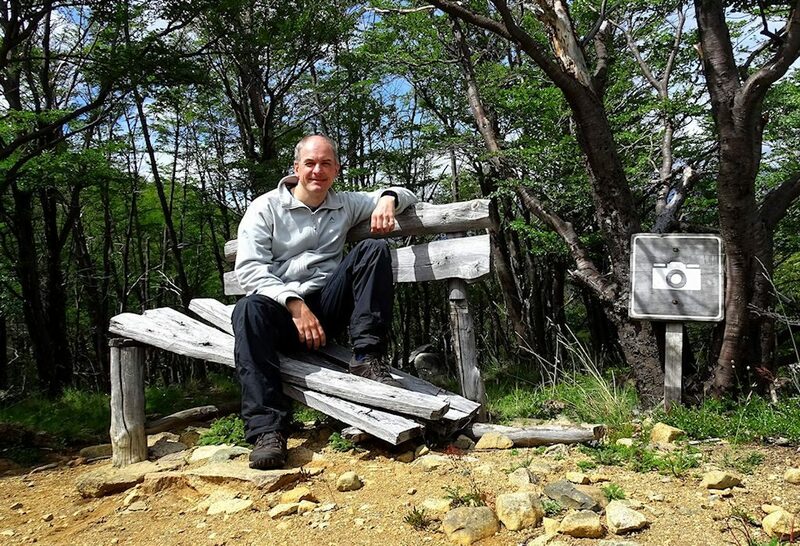 On a bench at a scenic spot on the way up to Cerro Castillo. Getting to Coyhaique by plane actually means flying to Balmaceda airport. It’s a tiny town right at the border to Argentina. There’s not even a petrol station there, but you can pick up a rental car at the airport nevertheless. If you book a rental pickup from Coyhaique, you must travel there by airport shuttle first. It takes about an hour and costs less than 10 dollars. Shuttle drivers show up for every arrival to the airport. You typically fly via Santiago or Puerto Montt, but there is another great option if you want to combine this with for example Torres del Paine. DAP Airline / Aerovias DAP (dapairline.com) has two direct flights per week between Punta Arenas and Coyhaique. There may be large delays, because the same plane goes to Antarctica, where weather issues often mess things up. It’s usually still faster than flying via Santiago or going by bus, and probably also way cheaper. I wouldn’t expect to be able to book a flight on-line, but if you go to one of their offices, they are friendly and helpful. In Coyhaique you will find them on the address Subteniente Cruz 63, or you can call them at +56 67 221 2898, speaking Spanish or English. I rented a car from Recazur, because they were significantly cheaper than the others. I got their cheapest car. I’m sure having a 4WD may feel nice on the rough road, but any car will get you through Carretera Austral as long as you drive with caution. They only operate in Spanish, though, so make sure you know what you’re buying. There are petrol stations in Coyhaique, Puerto Rio Tranquilo and Cochrane. You may be able to buy “second-hand” petrol from a barrel owned by a guy in Villa Cerro Castillo, but don’t count on it. If you don’t want to rent a car, you can get from Coyhaique to Puerto Rio Tranquilo by bus most days. It’s a rough ride, though. Those drivers just push on as fast as they can. There are also day trips from Coyhaique to see the marble caves, but with 5 hours of driving each way, that just doesn’t make sense. If you’re in El Calafate or El Chaltén, Argentina, you may be able to go by bus straight to Cochrane most days during high season. On some days there are even buses from Puerto Natales, “near” Torres del Paine. It’s a lengthy and slow detour, though. Check out Turismo Zaahj for details. 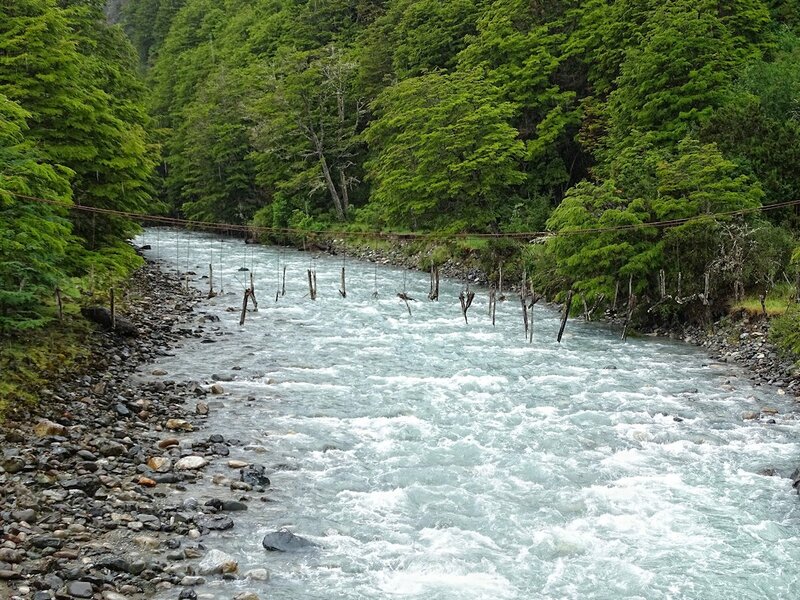 If you travel to the southern end of Carretera Austral, it is possible to cross between there and Argentina and El Chaltén by combining a hike and a boat. 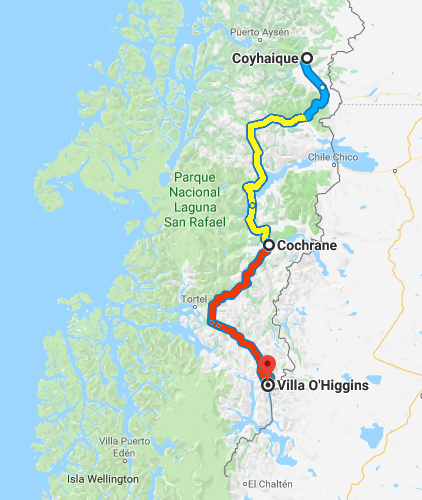 It’s a bit complicated and will probably take about two full days, starting or ending in Villa O’Higgins. The boat isn’t cheap, but it will include a cruise along an impressive glacier. Sleeping bag, even if you don’t plan on camping. You may have to spend a night in the car. Responsible camping is obviously a great option, but keep in mind that it can get really cold, wet and windy, so it’s good to know where you can take shelter if necessary. In Villa Cerro Castillo I stayed at Residencial & Restaurante Janito. You can’t miss it, it’s practically the first building as you arrive in the village proper. It was not good, but still great value for money. For food, check out the menu on the hippie bus across the road, at La Cocina de Sole. In Puerto Rio Costanera, I stayed at Hosteria Costanera. Also easy to find, right on the main road, opposite the booths where all the day trips are sold. It’s a bit pricey, but you get a really nice room for your money. Foodwise, I was a happy customer at the neighbouring Cerveceria y Restaurant Rio Tranquilo. In Cochrane, I stayed at the friendly Residencial Cero a Cero. It’s cheap, and they have a cat. I also looked at the place across the street, Hotel Ultimo Paraiso. It’s excellent, but also very, very expensive. I had my best meals on this trip at Ada’s Cafe Restaurant, although I don’t know if it’s because the food was so good or because I was so exhausted after full days of hiking. There are perfect camping grounds at Camping Los West Winds inside the new national park, and they offer lodge accommodation and restaurant food as well. See the Patagonia Park web site for further details. All the trails in Patagonia Park are excellent. My favorite is the fairly demanding Lagunas Altas Loop (23 kilometers) starting from Estancia Valle de Chacabuco visitor center. Also check out the Valle Aviles Loop, starting at the Stone House Campground / Camping Casa de Piedra, a bit further up the valley from the visitor center. I love the hike up to the emerald lake below Cerro Castillo, starting from the village. There’s a ranger office where you pay a small fee and get directions, if it’s open. If not, just follow the main road out of the village to the northern side of the river and then follow a rocky gravel road westwards. Do NOT drive this road with anything less than a battle tank. Keep walking until you reach a river coming down from the mountains. Climb the fence and follow the river up on the east side, and you’ll find the trail soon enough. From there on you just follow the edge of the river and eventually a ridge to the mountain lake. The hike I just mentioned can be expanded to a four-day Torres del Paine-like hike. Google for updated information, here’s some I found just now. If you make it all the way to Villa O’Higgins, consider spending two days on boating and hiking across the border to backpacker paradise El Chaltén, Argentina. I only hear good things about it.